Dunbar and Boardman: What are the Tallest Buildings on Each Continent? The world’s tallest buildings have long fascinated the general public as well as those employed in the vertical transportation industry. We have Elisha Otis to thank for the creation of our vertical transportation industry of course. You can read about his contribution 'here'. With this week’s post we have chosen to highlight the world’s tallest buildings on a continent-by-continent basis. Some of these buildings you will be familiar with, others less so. Let us know how many of the seven tallest buildings you have visited in the comments section below. 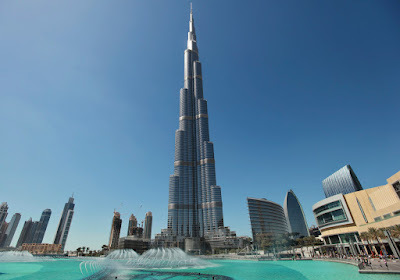 The tallest building in Asia is Burj Khalifa. Burj Khalifa was built in 2010 is located in Dubai in the United Arab Emirates. It is the tallest artificial structure in the world and stands 828m or 2717 feet high and has 160 floors. The building has 57 lifts and 8 escalators. The lift cabins have a capacity of 12 to 14 people. The lifts installed at Burj Khalifa are the world’s fastest Double-deck elevators equipped with LCD entertainment units. The tallest building in Europe is set to be the Federation Tower in Moscow. Its height is 374 metres or 1227 feet and it has 101 floors. It is a complex of two buildings built on one podium. One of the towers stands 97 floors high (Tower East) and the second tower (Tower West) stands 65 floors high. Construction originally started in 2003 but was halted and only resumed in 2011. The Tower is due to be finally completed towards the middle of 2016. There are 67 lifts at the Federation Tower. Twenty Two TWiN elevators have been installed with equipment from ThyssenKrupp (Germany) and Schindler (Switzerland). The tallest building in North America is New York City’s One World Trade Center completed in 2013. It has a height of 541.3 metres or 1776 feet and has 104 floors and is a symbol of renewal and hope. There are 73 lifts and 11 escalators at One World Trade Center, designed and installed by ThyssenKrupp. The five express elevators travel at over ten meters per second, which is close to record-breaking speed. The tallest building in Oceania is Q1 or Queensland Number One. The Skyscraper is located on the Gold Coast in Australia. The building is 322.5 metres in height or 1058 feet and has 78 floors. Q1 is the tallest all residential building in the world and was opened in 2005. It has 11 Kone lifts that travel at a speed of 9 metres per second. The tallest building in South America is the Gran Torre Santiago located in Santiago, Chile. This skyscraper is 300 metres in height or 984 feet and has 64 floors and 6 floors below ground too. Although construction commenced in 2006 due to some delays the building was only completed in 2013. The building has 24 high speed lifts that travel at 6.6 metres per second. The tallest building in Africa is the Carlton Centre located in Johannesburg, South Africa. Constructed in 1973 the Carlton Centre is 223 metres high or 732 feet and has 50 floors. The building houses offices and shops and has 46% of the floor area below ground level. The Carlton Centre has 18 lifts arranged in 3 banks of 6 serving different sections of the Tower. In addition there is one express lift serving the observation platform known locally as ‘The Top of Africa’. The lifts travel at a speed of 1400 feet per minute. Preparation Buildings. The buildings are located at McMurdo Station on volcanic rock at the southern tip of Ross Island on the shore of McMurdo Shore, Antartica and form part of a United States research centre. Built in 2005 they are 15 metres in height or 49 feet and do not have any lifts. Given the climate it is no surprise that the Long Duration Balloon (LDB) Payload Preparation Buildings are the least visited buildings on our list. The climate is also the reason that the buildings need to be moveable – previous buildings were covered in snow during the winter and it took several weeks for them to be dug out and useable again. The Long Duration Balloon (LDB) Payload Preparation Buildings are a solution to that problem because they are movable buildings on skis that have been placed on a snow platform known as a berm. Thanks your blog article is great kindly update threading machine for sale content is more helpful to us. Your blog improves my knowledge about tallest buildings in the world. Dr Andrew Unterweger is a specialist person in this field. If you have any problem, you can contact with him.